The town of Jubbata al-Khashab has joined reconciliation in Quneitra and became clear of terrorism after the exiting of terrorists who refused settlement to northern Syria along with their families after they handed over their heavy and medium weapons. 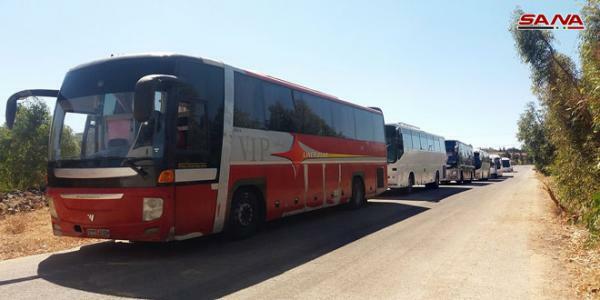 SANA’s reporter in Quneitra said that the last batch of terrorists left the town of Jubbata al-Khashab and the villages affiliated to it via six buses via Ofania corridor to northern Syria. The settling of legal status of militants who preferred to stay in the town will be done during the few upcoming days as well as the entry of the Syrian Arab Army to comb the area from the remnants of terrorists, the reporter said. The reporter added that Jubbata al-Khashab town and the villages affiliated to it are now totally free of terrorism while some terrorist groups who refuse settlement are still positioned in the villages of Briqa and Beir Ajam and they will be evacuated during the upcoming days. Weapons, which were handed over by terrorists, are: 5 tanks, a Shilka wagon, a Fusdika vehicle, a BRDM vehicle, a BMP vehicle, heavy machineguns, a US-made TOW missile base, a fire truck and a large quantity of miscellaneous ammunition, improvised explosive devices and rocket launchers.